Dan Norris is the founder of Start Get Ready and solo indie dev. His first game Sleepy Mouse is due to release as an iOS app for both iPhone and iPad August 2016. 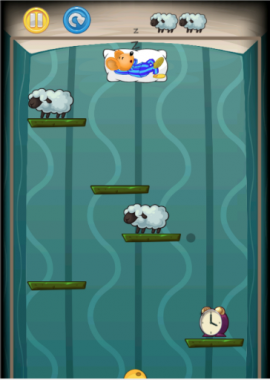 Sleepy Mouse is a 75-level, 2D physics based puzzle game. Get the cheese to Sleepy Mouse before he wakes or he’ll be hangry!! The first game I ever played was Horace Goes Skiing on the ZX Spectrum. I’d never used a computer before and I thought it was the best thing ever! I got hooked on Rainbow Islands age 9, in the days before you could save games and I can remember crying as I’d got to the end of level Badie and failed, yet again! It took hours to get there! I wrote my first ever program on an Amstrad PCW9512 at the age of 9, and was hooked immediately. I loved that I could get the computer to do something I wanted it to do. I got the computer to tell the user their name and favourite colour and thought that was amazing! I still get that same feeling today when I program. For Sleepy Mouse I wanted to make a 2D puzzle game, that was simple but compelling. Something that anyone can pick up and immediately get the hang of. The old games, in the main, where all like that. There weren’t huge worlds, or massive stories, you could just pick them up and play. There’s an amazing moment that occurs when you put a few test levels together and it just works. It just feels right and you can already see lots of scope to move the game forward with different types of obstacles with exciting ways to use them, to create great levels. 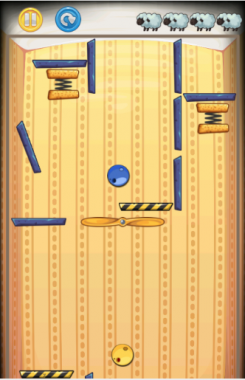 You can see how puzzle progression will work with these obstacles, taking the player through more and more interesting setups, gradually getting harder. It’s an incredible moment, when it works. I tried a few different ways to build the game, Cocos 2D, Xcode with my own Physics engine (a big mistake), Xcode with Box2D and finally got round to trying Unity 3D. I built a quick version of the game mechanics in Unity, which took a couple of hours and was utterly blown away by how easy and quickly I could put things together. Building silly games, as a kid in the 90s, I’d had to build level editors and to handle all my own drawing (building buffers off screen in memory to then switch out with the current screen image). Unity handles it all for you. An animation that may have taken hours or even days to build and get smooth, can genuinely be a matter of a few minutes work with Unity. I took my raw idea immediately to development and didn’t have to worry about graphics pipelines, physics engines, or the most efficient way to import a sprite and simply built my game. Development teams can handle this sort of thing, it’s very time consuming for a solo developer, so Unity has been an indispensable tool to the whole process. From the very beginning of development, I decided Sleepy Mouse would be a free to play game but still wanted the ability to generate some revenue. I’m really against pay to win games, or games that are overwhelmed with ads. I added in Unity Ads as a feature to enable game players to skip levels by watching an ad, allowing them to further their progress on the game but not forcing ads upon them. It worked from the start and is a means that players can get through the whole game, without any ads if they put the work in to complete it. Unity also works beautifully with Everyplay and was really easy to integrate. This is a great way for players to show off their best shots to friends through social media channels and in turn generate additional exposure for the game. I let my dad, whose not a technical guy, play an early version of the game and one of the first things he sent me was an Everyplay video of him completing a level. It was a great moment. Even having a great tool, even knowing that I had a good idea, one that I really believed would work, solo developing a full game is a tough process. Finding time whilst having another job, trying to motivate myself during those times when there seems like there’s way too much to do, or just not making any progress. Pushing through the times when I needed to completely re-do large chunks of code because things that worked well on the PC were way too slow on a mobile device. All this, with the ambient background noise of a new born baby screaming the place down, made things a real struggle. You hear great stories about very successful games being built in a few weeks and everything going perfectly, they release and make loads of money. These are inspiring stories but in general I believe solo development is more marathon than sprint, especially if your game has hand-built levels rather than self generating (endless runner type). To cope, I made a personal policy to do one Commit a day, in my source control software. Sometimes that might be a few new levels or a large piece of new development but more often than not it was a change in position of a piece of text, or adding an extra turn on a level, some very minor thing but always pushing forward every day. It’s taken the best part of two years doing about an hour a day after work, to complete Sleepy Mouse. It’s been a fairly slow process but by doing those little bits every day and not thinking too much about how big a task is ahead means you wake up one day and the project is almost done. There’s so many things to think about, things I’d never even considered when making a prototype; puzzle difficulty curves, UI for every eventuality, optimising and building graphics for different devices, App store deployment, source control, not to mention the huge learning curve of undertaking a marketing campaign prior to game release. The hardest thing, and thing I thought would be easy, was developing fun, creative yet challenging levels. It definitely gives me a better appreciation of what goes into the big puzzle games! It was also hard to stay motivated – when you’re developing on your own the progress isn’t very quick. I gave myself a break to focus on family life and when I came back to it I could look at it objectively and see that it was a good game. 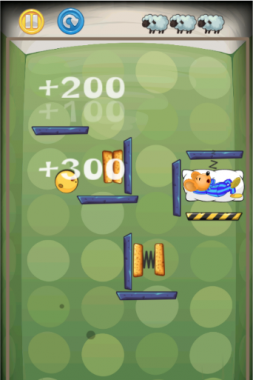 If Sleepy Mouse proves popular on iOS I’ll definitely be releasing new levels that incorporates new obstacles and puzzles and will convert for Android. I’ve also got a number of different ideas and prototypes for new games – one involving sharks hunting shoals of fish – completely different to Sleepy Mouse. This would be a 3D turn-based strategy game that you’d play against other networked players – you’d each have 3 sharks, each with different abilities (speed, power, and defense against other sharks). You need to strategize to break up the shoal whilst keeping other players sharks away. It’s very early days but something that I’m excited to explore further once Sleepy Mouse is complete. I’d built prototypes of games when I was younger but never actually completed a full game. I remember when I was a kid, my mum promised to buy me a version of Turbo C++ if I could prove I’d learnt BASIC by building a game. So I built a text adventure for her, which did the trick and got me a version of C++. During the development of Sleepy Mouse I learnt very quickly that building the mechanisms for a game and maybe creating one or two levels is an entirely different process to building a completed product, ready for release. Sleepy Mouse will be my first fully completed game and is due for release as an iOS app for both iPhone and iPad August 2016. I’ve just released the debut game trailer for Sleepy Mouse on YouTube https://youtu.be/PC5nigFQ1F4. The Amiga 500 was the thing that really got me into games. I saw it for the first time at a friend’s place, they were playing Batman the Movie, and I just couldn’t believe the graphics! It was love at first sight! The jump from ZX Spectrum to the Amiga was huge. The Playstation was a real game changer for me. It was the first time I’d ever played games with proper, real life physics in them. It was probably one of the first consoles that had the processing power. Growing up in the Amiga days there were so many amazing games. I loved Populous, Mega Lo Mania, Sensible Soccer and the Secret Of Monkey Island Series. They still set the benchmark for games today, which although have made massive steps forward in graphics, physics and AI, still take lots from these landmark ideas. I’ve switched more towards playing games on PC and particularly love strategy games like the Total War games. I went through a phase of playing Driver loads on the Playstation but I guess that was a while back now. Possibly one of the worst made games I’ve played was Gangsters on the Spectrum – it just crashed all the time! I’ve great memories of it though and used to spend hours playing it with my brothers and we’d all shout each time it would crash! Not sure if the fact that we found if fun makes it a good game though, the eternal question in any entertainment I guess. I’d love to see some of the game developers for AAA games today filmed playing some of the old classic retro games and then talking about what made these games so great and how concepts have evolved into current games.